The town of Rimini is located on the Adriatic coast about 125 km southeast of Bologna. In the eighteenth century it was a major stop on the road between Rome and Bologna. 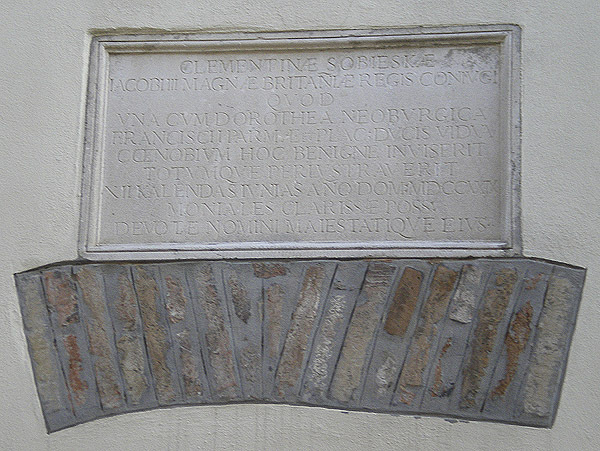 In the southern corner of the city on the street wall of a building at Via Santa Chiara 30 is an inscription in honour of Queen Maria Clementina (wife of King James III and VIII).1 This is just to the right of Vicolo Montironi and the Santuario della Madonna della Misericordia in Santa Chiara (as one faces the church). in honour of her name and majesty. Queen Maria Clementina had left Bologna to return to Rome on May 9, 1729, accompanied by her younger son Henry, Duke of York (later King Henry IX). Her mother's older sister, Dorothea Sofia, Dowager Duchess of Parma (whom King James III had visited in Parma in June 1728) had arrived in Bologna on April 21. She left Bologna on May 2 heading for Loreto. Presumably the two parties met in Rimini as Dorothea Sofia was returning from Loreto. 1 I thank Viviana Castelli for informing me of the existence of this inscription. Image 1 (Inscription): © Viviana Castelli 2011. This page is maintained by Noel S. McFerran (noel.mcferran@rogers.com) and was last updated October 24, 2011. © Noel S. McFerran 2011.